SCADTA flew a series of experimental flights until September 1921 when a regular schedule was adopted. All of the major catalogs fail to recognize that the first of the provisional surcharges was May 2, 1921, not the fall of 1921. 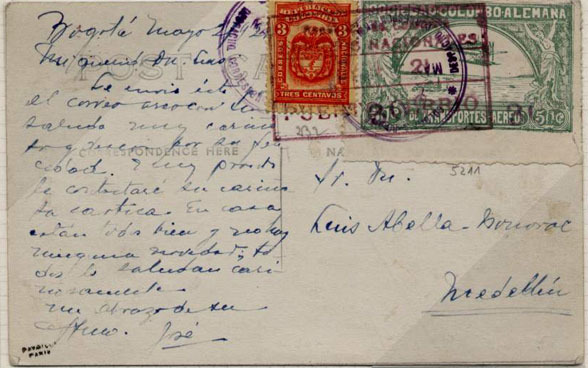 While the letter rate for its first flight was 50 centavos, it was reduced to 30 centavos. The surcharge was applied to the 50 centavo stamps when the office ran out of the needed stamps that day.